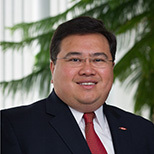 Corporate Vice President and Chief Sustainability Officer, The Dow Chemical Co.
Dr. Neil Hawkins drives strategy and implementation for Dow’s EH&S and Sustainability programs, including the enterprise-wide 2015 Sustainability Goals. He is a widely recognized authority on sustainable business practices, environmental policy and win-win solutions for business and ecosystems. Hawkins holds doctoral and master’s degrees from Harvard University, and is an alumnus of Georgia Tech.